My chance encounter with desmids in the Pirin Mountains (described in the previous post) was serendipitous insofar as, less than a fortnight after my return from Bulgaria I find myself standing beside a soft water tarn in the Lake District noted for its rich desmid flora. I’m here for a joint field meeting of the British Phycological Society and Quekett Microscopical Club and, having decided on a venue, realised that the location of the Freshwater Biological Association’s laboratory meant that desmids were the obvious focus of our investigations. So, on Friday afternoon, a small convoy of vehicles made its way from the FBA, on the west side of Windermere, via Hawkshead and Coniston, to two small tarns for an initial collecting trip. Dave John, our in-house desmid expert, had been directed to these by David Williamson, the UK’s leading expert on desmids (but, alas, too elderly and infirm to join us), who had recorded large numbers of desmids from both Kelly Hall Tarn and Long Moss Tarn. Fortunately, the weather today was rather more amenable to sampling than my previous desmid-hunting trip in this part of the world (see “Damp days in search of desmids”). 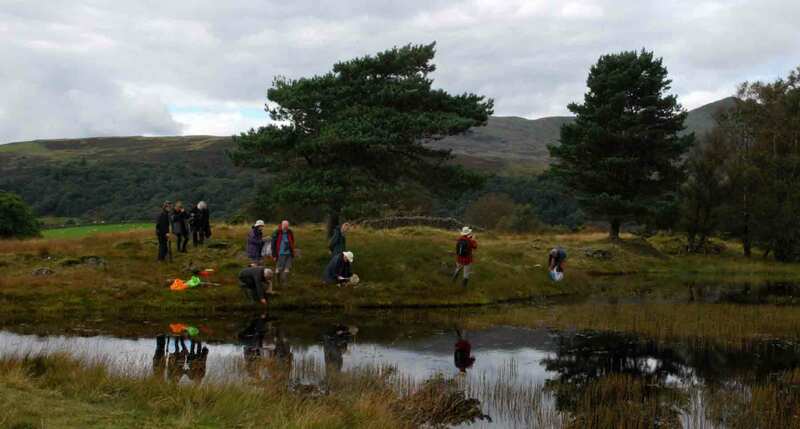 The predilection of desmids for boggy areas means that there is always a risk of damp feet when –collecting samples, especially when grabbing a chance sample whilst out walking. Last time, my problem was that footwear appropriate to getting to Dock Tarn was not really appropriate for getting into Dock Tarn; today, however, I could tramp the short distance from our vehicles in wellies. Dave noted wryly that most of David Williamson’s best sites were close to car parks, and that many of the sites sampled by the Wests, writers of a significant desmid flora of Britain in the late 19th century, were similarly placed closed to train stations. Such practicalities probably lie behind more of our decisions about where to sample than we care to admit. 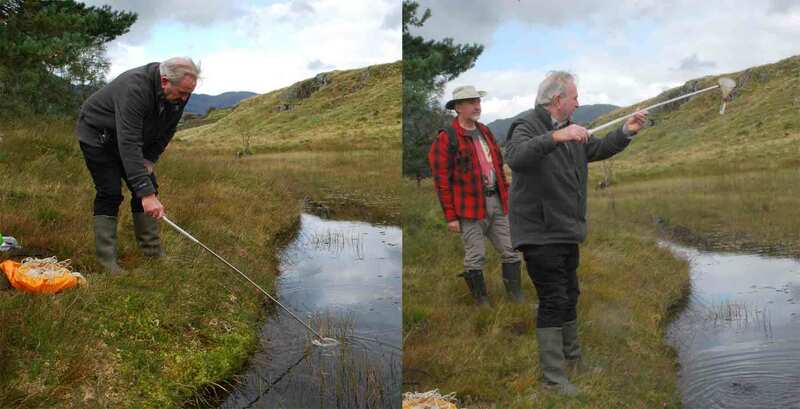 Once by the edge of the Kelly Hall Tarn, Dave gave us a demonstration of sampling desmids, starting with David Williamson’s preferred method using a plankton net. There are two options – either casting a net attached to a piece of rope, then drawing it back through the water or using a small plankton net attached to a telescopic handle. Dave’s has a mesh of 33 micrometres (1/30th of a millimetre) which is fine for relatively large algae such as desmids. He took care to avoid disturbing the bottom, in order to collect only phytoplankton but also pulled the through patches of submerged plants in order to dislodge the algae that live around their stems and leaves. With care, it is also possible to brush the net gently against the bottom, dislodging some of the heavier desmids that typically sit just on the surface of the bottom sediments. Too much disturbance will mean that the net quickly clogs with fine sediment particles. Dave John demonstrating how to sample desmids with a plankton net at Kelly Hall Tarn, Cumbria, September 2017. From Kelly Hall Tarn it was a short uphill walk to Long Moss Tarn for our second demonstration. There is usually a part of the perimeter of tarns in this part of the world that is marshy, often dominated by Sphagnum. The hummocks of Sphagnum were of no great interest except as stepping stones to the edge but, once there, we could see the semi-aquatic Sphagnum cuspidatum living at the margins of the lake (moss cognoscenti describe S. cuspidatum as looking like “drowned kittens”). Dave took a handful of this soft, damp moss, flicked it a couple of times to remove surplus water, then gently squeezed it, catching the water that oozed out of the moss in a small sampling bottle. Holding this up to the light, we could see a distinct green tinge which brought a big smile to Dave’s face, anticipating the rich haul of desmids that awaited us. 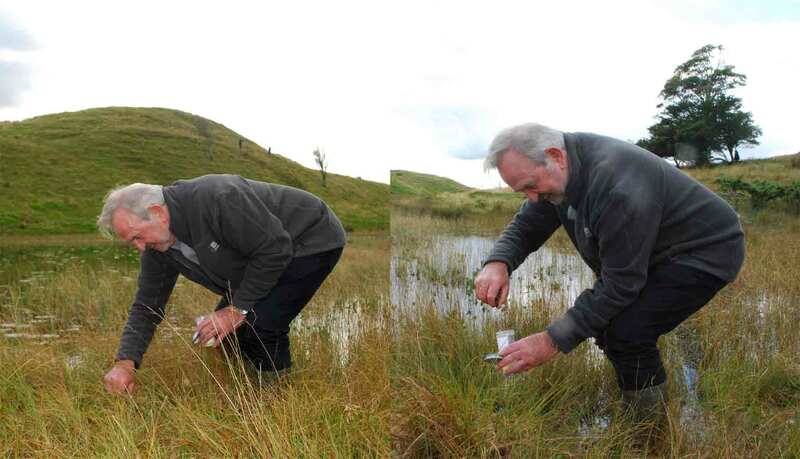 Dave John demonstrating how to collect desmids by squeezing Sphagnum at Long Moss Tarn, Cumbria, September 2017. 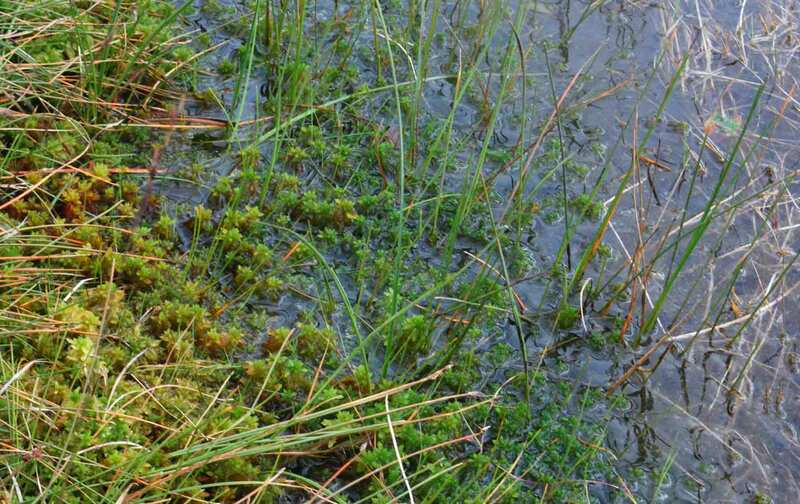 A patch of Sphagnum cuspidatum at Kelly Hall Tarn: perfect desmid habitat. Kelly Hall Tarn had one further attraction for me. It is perched on a hillside overlooking Coniston Water and from a small knoll a couple of hundred metres from the tarn I had a wonderful view southwards down the lake. In the middle distance I could see Peel Island which was the inspiration for “Wild Cat Island” in Arthur Ransome’s Swallows and Amazons, a book that I read and re-read many times as a child. At the north end of the lake you will find Bank Ground Farm, which was the setting for “Holly Howe” in the book and which, I notice, still offers accommodation and can be booked via Airbnb. Finally, on this theme, the Steamboat Museum in Windermere has the original “Amazon”, the sailing dinghy that is the centre of many of the adventures. Enough of these digressions. We now have samples from two tarns and the next post will start to explore the contents of these and other samples that we collected. The view down Coniston Water from Long Moss Tarn. Peel Island is in the centre of the picture. This entry was posted in desmids and tagged algae, Coniston Water, desmids, Lake district. Bookmark the permalink.